Microorganisms have are certain physical and chemical requirements they must possess to survive, reproduce, and grow. What do microbiologists consider microbial growth? ​ Microbiologists use the term growth to indicate an increase in a population of microbes rather than an increase in size. One of the reasons prokaryotic organisms, like bacteria, have been so successful for billions of years, is that they reproduce very quickly using a process called binary fission. Binary fission creates two genetically identical daughter cells from one single parent cell. This process is more simple than mitosis, which occurs in eukaryotic cells, and it requires less energy. Prokaryotic cells reproduce asexually. Most often the asexual process of cellular reproduction is done by a process called BINARY FISSION. 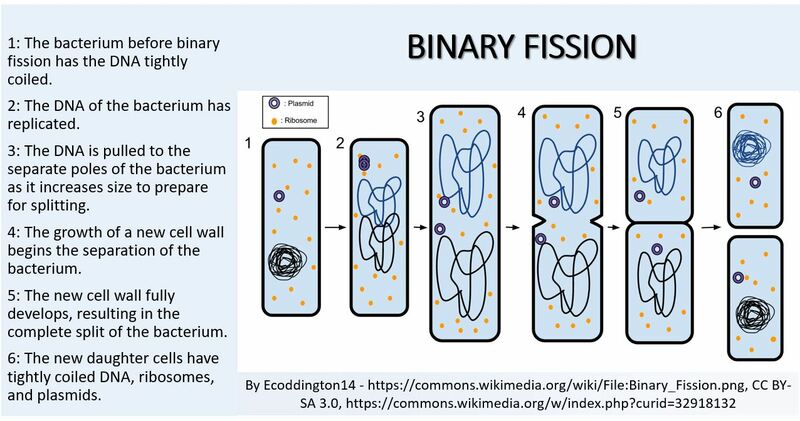 Most bacterial organisms reproduce by an asexual process called binary fission, which usually occurs after a period of growth in which the cell increases in size. The bacterial chromosome is replicated at the beginning of binary fission, resulting in 2 DNA molecules. The 2 chromosomes separate rather easily compared to cell division in eukaryotic cells. Bacterial cells do not require a mitotic spindle (or centrosome) to separate their replicated chromosomes, like eukaryotic cells do. Following chromosomal segregation, a septum is formed at the midline of the dividing cell. The septum continues to grow and eventually separates the dividing cell into two genetically identical daughter cells. Microorganisms reproduce rapidly using binary fission. Microbes will reproduce exponentially as long as they have the needed nutrients and space and have a habitat free of toxins. This means that a single microorganism can quickly generate a population of cells that are astronomical in number! 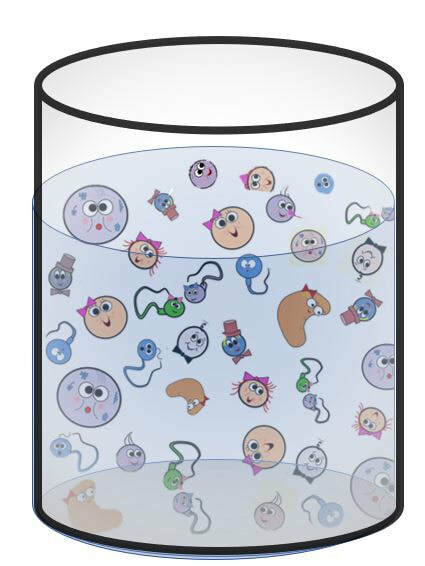 Generation Time - This is the time required for a population of cells to double in size. Most bacteria have a generation time of 1-3 hours. The interval of time between successive binary fissions of a cell or population of cells is known as the generation time (or doubling time). ​Under optimal conditions, some species have a very fast generation time; for others, it is much slower. For example, the optimal generation time. Treponema pallidum (spirochete that causes syphilis) = 33 hours. If Escherichia coli were able to undergo consecutive rounds of binary fissions uninterrupted for only 36 hours, they would be able to cover the entire surface of the Earth! So, WHY ARE WE NOT KNEE-DEEP IN E.COLI? 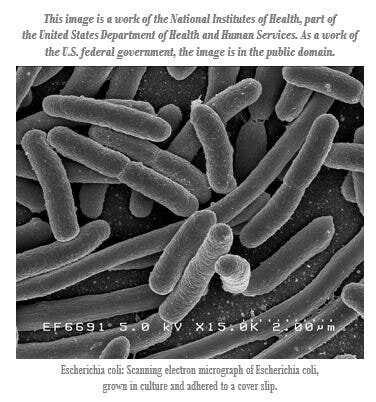 E. Coli, like any other cell have needs! They require proper nutrition, they require certain environmental conditions, and perhaps... a little bit of love? Pathogenic microorganisms (microbes that cause disease) that have a shorter generation time, will produce symptoms more quickly in organisms that they have infected. The period of time that exists between exposure to the pathogen and the onset of symptoms is called the incubation period. In other words, we can say that the faster a microorganism reproduces, the shorter incubation period will be experienced for the disease cause by the microorganism. Most of us have had some form of food poisoning at some point in our lives. Some strains of E. coli (pathogen E. coli O157:H7) can cause food poisoning. If you were to ingest only one of these pathogenic cells with your under cooked breakfast at 8:00 AM, your body would have over 2 million E. coli cells by only 3:00 PM that afternoon! When we analyze bacterial growth, it is convenient to create a graph of the number of bacteria versus time. 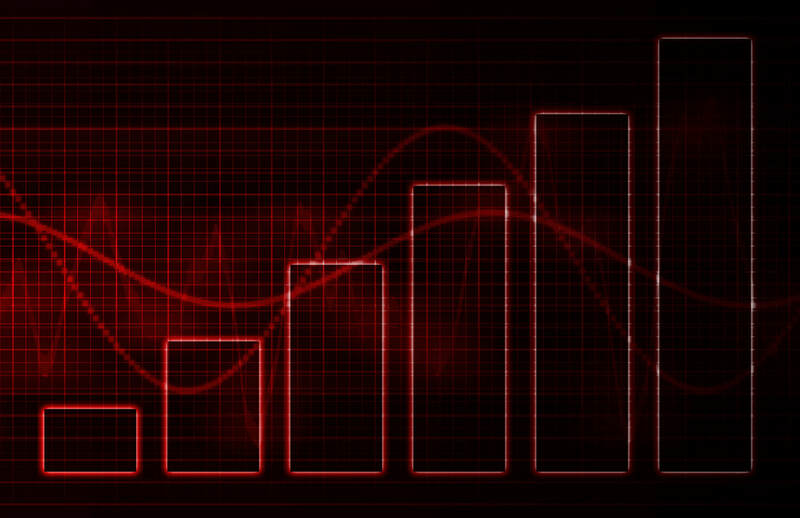 This type of graph is called a "growth curve". Analyzing these growth curves reveals distinct phases of bacterial growth. The Lag Phase - The lag phase of the growth curve is generated from the bacteria adjusting to their new environment. The cells will not undergo binary fission until they have adapted to the new habitat. 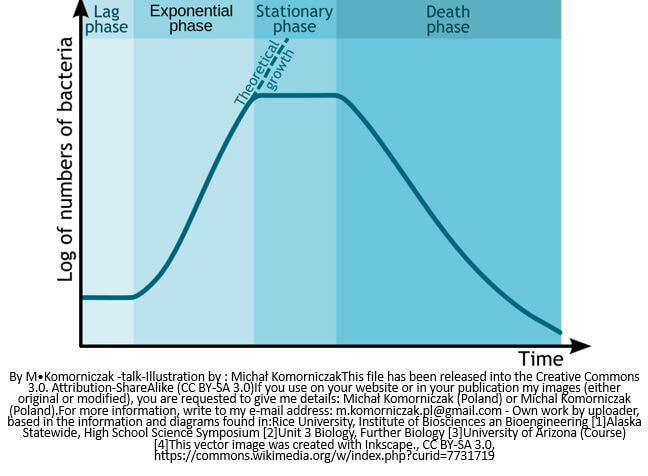 The Log Phase - The log phase of the growth curve reveals the active growth of bacteria in the population. The Stationary Phase - When the population of bacteria begins to run out of space and nutrients and/or when toxins are built up in the culture, the log phase will give way to the stationary phase. In the stationary phase, the number of bacteria cells in the population will remain fairly consistent due to the fact that the number of cells being created will be roughly equal to the number of cells dying. The Death Phase - After some time, the depletion of nutrition and space and the buildup of toxins in the culture, will cause more cells to be dying than cell being produced. This is the death phase of the growth curve. Endospores are dormant structures that can endure times of environmental stress. A few gram-positive bacterial species, such as the soil-dwelling bacteria of the genera Bacillus and Clostridium, produce endospores in times of stress. 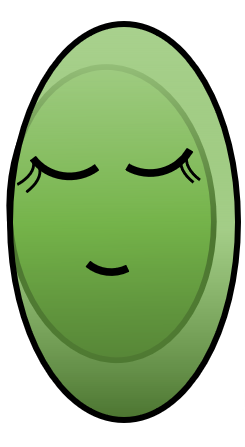 When environmental conditions are good, bacterial cells grow, mature, and reproduce as vegetative cells. However, when condition for growth become strained, these bacteria are able to survive harsh conditions through spore formation or sporulation. The smaller cell will become the spore. The larger cell becomes the mother cell. The mother cell engulfs the spore. The spore forms a cortex and a protective coat. The cell will stay in this state until conditions improve. When conditions improve, the mother cell expels its endospore and undergoes germination which allows it to return to its normal vegetative state. Microorganisms are everywhere; on our skin, on surfaces and in the air. Because this is the case, it is important to protect cell cultures from contamination. 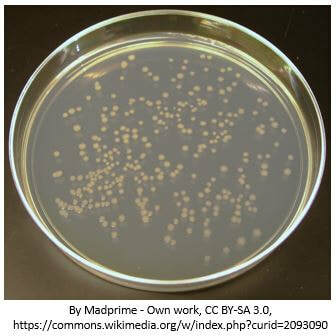 Microbiologists are usually intending to grow axenic cultures. An axenic culture will consist of a colony of cells generated from a single parent cell (progenitor cell) or colony-forming unit (CFU). In order to produce such a cell culture, efforts must be taken to sterilize any substance, media, loops, glassware, etc. that may come into contact with the culture. Sterile techniques have been developed to reduce the risk of contamination. Here are some of the more popular sterile techniques used today. The Streak Plate Method. In this technique, a sterile inoculating loop is used to spread an inoculum across the surface of the agar in a Petri dish. The dish or plate will develop colonies following a time of incubation. The Pour Plate Technique - In this technique, colonies are isolated through a series of serial dilutions. The final dilution is then added to warm agar in a Petri dish. The dish will produce colonies after an incubation period. Nutrition is a process of acquiring chemical substances from the environment. Nutrients are used to make energy for the cells and to provide the necessary building blocks for the replacement and repair of cellular components. The nutritional requirements of cells includes at a minimum, the macronutrients carbon, hydrogen, oxygen and nitrogen. Cells also require trace amounts of micronutrients like Mn, Zn, Fe and Ni. The nutritional needs of life. Nutrients that are needed in relatively large amounts are categorized as macronutrients. Nutrients that are needed in small amount are considered micronutrients or trace elements. Macronutrients include nitrogen, oxygen, hydrogen, sulfur and phosphorus and are used as building blocks for the cell. Micronutrients are ionic forms the transition metals magnesium, potassium, sodium, calcium and iron. These ions are often used as cofactors or coenzymes within the cell and are needed in only very small quantities. • Used in food preservation. • High concentration of salt or sugar draws the water out of microbial cell. its molecular form (O2), it can be toxic to some forms of microorganisms. Organisms that do require oxygen obtain it from the air or from water. Sulfur is used by organisms for protein synthesis, cellular respiration and photosynthesis. Organisms obtain it from the from sufur-containing amino acids methionine and cysteine as well as sulphates and sulphides. ​Phosphorus is needed in cells for the production nucleic acids and phospholipids, as well as other molecules such as ATP. Growth, in terms of microbiology, refers to the number of individual organisms that make up a population of microbes. For example, when bacteria cells are allowed to grow on an agar plate, one single bacterial cell will reproduce via binary fission and give rise to a colony or genetically identical bacteria cells that were all generated from a single parent cell. 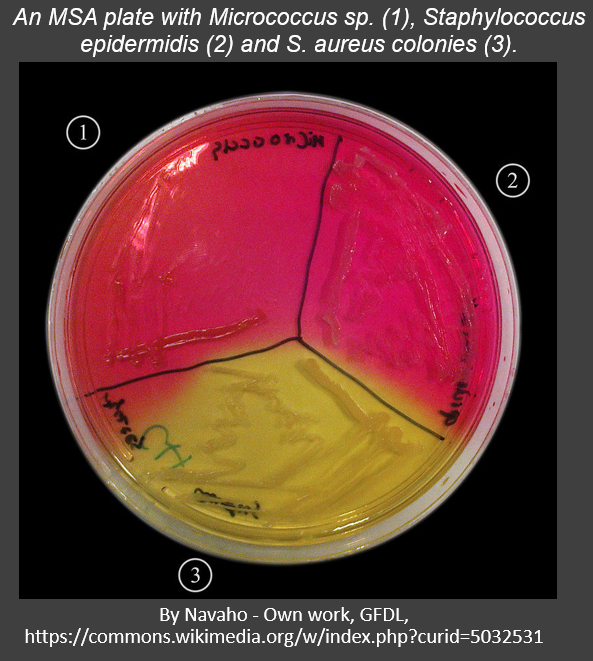 The photo is of individual colonies of E. Coli cells grown on an agar plate. All cells require three things to conduct metabolism: a carbon source, a source of energy, and a source of electrons or hydrogen atoms. Different organisms are able to use different compounds as their source of carbon. There are 4 classes of organisms based on what they use as a source of carbon and what they can metabolize for energy. Energy Source - Photoautotrophs use light energy from the sun to make their own food. Energy Source - Chemoautotrophs catabolize (break down) organic molecules (lipids, carbohydrates and proteins) for energy. Carbon Source - Photoheterotrophs catabolize organic molecules as a source of carbon. Energy Source - Photoheterotrophs use light from the sun as an energy source which they use to undergo photosynthesis. Energy Source - Chemoheterotrophs use organic compounds as a source of energy, as well. The terms "photo-" and "chemo-" refer specifically to the energy source the organism will use. A phototrophic organism will obtain energy from sunlight, whereas a chemotrophic organism will obtain energy from organic molecules (proteins, lipids and carbohydrates). Obligate Aerobes ​- ​Obligate Aerobes use oxygen as the final electron acceptor in the electron transport chain. Obligate Anaerobes - Obligate Anaerobes use another inorganic compound (other than oxygen) as the final electron acceptor in the terminate step of the electron transport chain. Some species of obligate anaerobes cannot tolerate oxygen and will die if exposed to oxygen. Facultative Anaerobes - Facultative anaerobes are able to use one set of metabolic processes when oxygen is present, and another one when oxygen supply is lacking. However, these organisms will undergo aerobic respiration if oxygen is present, because it generates a lot more ATP than anaerobic metabolic pathways. Aerotolerant Anaerobes - Aerotolerant anaerobic prefer to live in the absence of oxygen, but can tolerate being in the presence of oxygen without dying. These organisms are able to tolerate oxygen, because they contain vital enzymes that detoxify dangerous oxygen-containing compounds that would have otherwise had toxic effects in the cell. Microaerophiles - Microaerophiles are microbes that require low levels of oxygen to thrive. Singlet Oxygen (O2) - A singlet oxygen is molecular oxygen that contains high energy electrons. These high energy molecules can be generated during the process of aerobic cellular respiration. These high energy electrons are very reactive and can lead to unwanted chemical reactions within the cell. Phototropic microorganisms have specialized pigments, called carotenoids, that are able to detoxify singlet oxygens by removing the excess energy from the electrons. Superoxide Radicals (02-) - Superoxide radicals can be formed when an oxygen molecule at the end of the electron transport chain undergoes incomplete reduction. Under normal circumstances, the oxygen molecules at the end of the electron transport chain receive 2 electrons from the electron transport chain, and 2 protons from the proton pump. This results in oxygen becoming water (H2O). Another source of superoxide radicals is when anaerobic organisms undergo their metabolic process in the presence of oxygen. Superoxide radicals can be detoxified by with the enzyme superoxude dismutase. Peroxide Anion (02 2-) - Peroxide anion can be formed during certain reactions catalyzed by the enzyme, superoxide dismutase. Two other enzymes, catalase and peroxidase, are able to detoxify the peroxide anion. Hydroxyl Radicals (OH) - Hydroxyl radicals are the neutral form of the hydroxide ion. These can be produced from ionizing radiation or when incomplete reduction of hydrogen peroxide occurs. Hydroxyl radicals are extremely reactive. Aerobic cells are protected from hydroxyl radicals, because their metabolic pathways do not use hydrogen peroxide. ​ Our Earth's atmosphere contains about 79% nitrogen (N2). Many microorganisms require nitrogen to live. However, very few organisms are able to utilize the nitrogen gas provided so abundantly by the atmosphere. Most microbes acquire nitrogen from organic or inorganic resources. There are small number of bacteria that carry out the vital function of nitrogen fixation. Nitrogen fixation is a process in which these specialized bacteria are able to convert nitrogen gas from the atmosphere into ammonia which is more readily used by organisms. While carbon, nitrogen, oxygen and hydrogen remain, by far, the most abundant elements in microorganisms, there are also some trace elements that make up a small amount of these tiny lifeforms. Examples of these trace elements include selenium and zinc. Microorganisms also require growth factors. 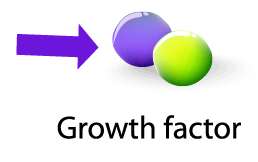 Growth factors are organic compounds that are required for life, but cannot be synthesized within the cell. This is somewhat similar to the "essential amino acids" that humans must consume in their diet to stay healthy. Humans must obtain essential amino acids from the foods they eat, because they are needed by the body, but the body is unable to synthesize these amino acids from other building blocks. Temperature - Different microbes have different temperature tolerances and requirements. Microbes will be able to grow, at least to some extent, when the temperature in within a certain range. However, microbes do have an optimal temperature that allows them to grow (reproduce) more rapidly. This temperature is known at the "optimum growth temperature". Microbes can be categorized according to their needs and tolerances of different temoeratures. Psychrophiles require temperatures below 20°C. Mesophiles grow best at temperatures ranging between about 20°C and 40°C. 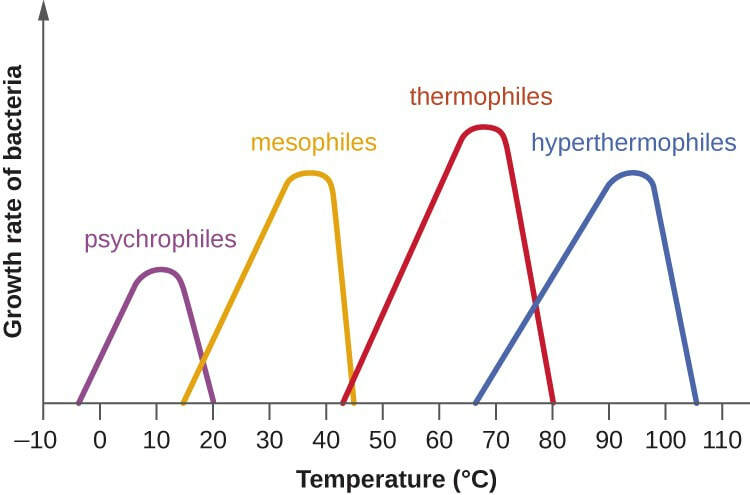 Thermophiles require temperatures above 45°C. pH - pH is the amount of hydrogen ions (protons or H+) or hydroxyl ions (OH-) that are free in a solution. The reason we refer to the acidity or basicity (alkalinity) of a solution as a "pH value", is because pH is the value of the "potential of hydrogen" The value of pH is calculated as the negative log of the molar concentration of hydrogen ions in solution. Living organisms are sensitive to pH, because the amount of hydrogen ions or hydroxyl ions will interfere with the normal chemical reactions (especially hydrogen bonding) in the cell. Microbes can be categorized according to their preference and tolerance of pH. Neutrophiles - Neutrophiles grow best when the pH is close to neutral, 7.0. Acidophiles - Acidophiles grow best in acidic environments with a pH as low as 0.0. Alkalinophiles - Alkalinophiles grow best in alkaline environments with a pH as high as 11.5. ​ Water is necessary to sustain life. Water is known as "the universal solvent", because it is able to dissolve more substances than any other solvent known. Microorganisms need water to dissolve substances in the cell and to participate in metabolic processes. enzymes and nutrients and to act as a reactant in many metabolic reactions. In nature, substances (including water) will diffuse from areas of high concentration to areas of low concentration. Cells are surrounded by a semipermeable plasma membrane that only allows certain solutes to travel across. This selective permeability will create osmotic pressure due to the amount of dissolved substances (solutes) in the extracellular fluid versus the intracellular fluid. Different microorganisms have different preferences and requirements of osmotic pressure. Microbes that do not have a cell wall can experience a phenomenon known as osmotic shock. Osmotic shock occurs when a microbe that lacks a cell wall is placed into an environment that has an osmotic pressure that it cannot tolerate. When the there are more dissolved substances in the surrounding fluid than there are inside of the microorganism, we call this a hypertonic environment. In a hypertonic environment, water molecules will diffuse out of the microoorganism, causing the microbe to undergo crenation (shrinking) which leads to death. When the surrounding environment contains fewer dissolved substances than there are inside the microbe, this is considered as hypotonic environment. In a hypotonic environment, there will be a driving force on water that drives the water molecules to travel into the microbe. This results in swelling or even bursting which leads to death. Microorganisms that have a cell wall are more resistant against osmotic pressure, yet they can still experience osmotic stress under certain conditions. We can classify microbe based on their preferences, tolerances and requirements for osmotic pressure. Obligate Halophiles - require the high osmotic pressure such as the osmotic pressure provided by salt water. Facultative Halophiles - do not require high osmotic pressure, but they are able to tolerate the high osmotic pressure created by salt water. Osmotic pressure is not the only type of pressure that water is able to exert on microorganisms. As anyone who has ever dove into the deep end of a pool knows, the deeper the water is, the more pressure is exerted on the organism. The pressure that exists in the deep ocean creates an environment that few organisms can survive. The organisms that make these depths their home, swell or literally explode as they are brought to the ocean's surface due to the lack of pressure. Barophiles - are specially adapted to live in high barometric pressure environments. The physical structure of their membranes, as well as the proteins and enzymes the barophile needs for life, will require high pressure in order to maintain their shape. Microbiologists collect a small sample of microbes from a given source (we call this small sample an "inoculum") and place them into a medium that contains the nutrients needed for growth. This creates a cell culture. The medium can be in a liquid form (called broth) or in a somewhat solid, gelatin-like form (called agar/agarose). Agar - Agar is the most widely used culture media. It has no nutrients, but can be added to nutrient broth to a form nutrient-rich agar, called nutrient agar. ​It consists of a complex polysaccharide that has a low melting point and is easy to work with. 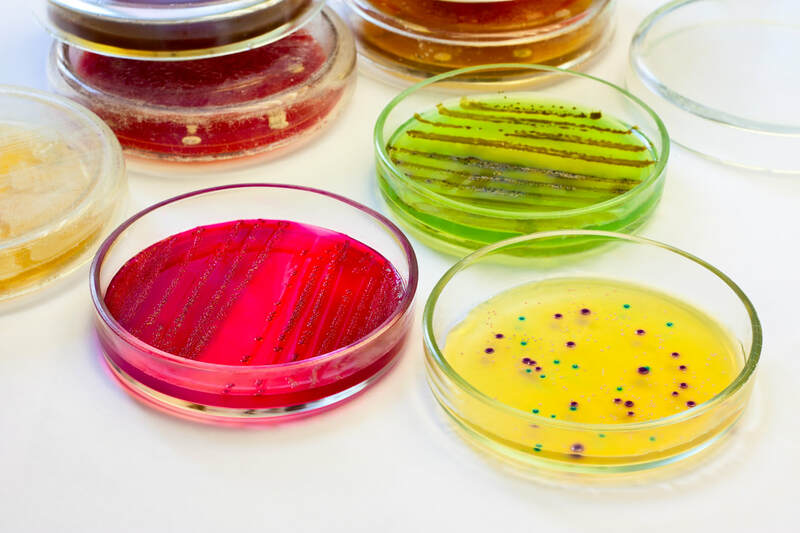 Warm agar can be pour into Petri dishes to form Petri plates, or poured into test tubes that will be kept slanted until the agar solidifies to become slant tubes (or slants). Nutritive Media - is defined as any media that support the growth of a wide range of microorganisms. Differential Media - Differential media is manufactured to undergo visible changes depending on the types of colonies produced. This media assists the microbiologist in identifying more than one microbial species which may be present in a sample. Reducing Media - A reducing medium is used when culturing anaerobes, because it contains compounds that remove free oxygen from the solution. Selective Medium - A selective medium contains ingredients to inhibit the growth of certain microbes in a mixture while allowing the growth of others. Differential medium types are those that distinguish microorganisms from one another based on growth characteristics evident when grown on specific medium types. Organisms with differing growth characteristics typically show visible differences in growth when placed on differential media. Examples include blood agar, Eosin Methylene Blue (EMB) agar, Mannitol Salt agar, and MacConkey agar. Selective medium types are formulated to support the growth of one group of organisms, but inhibit the growth of another. 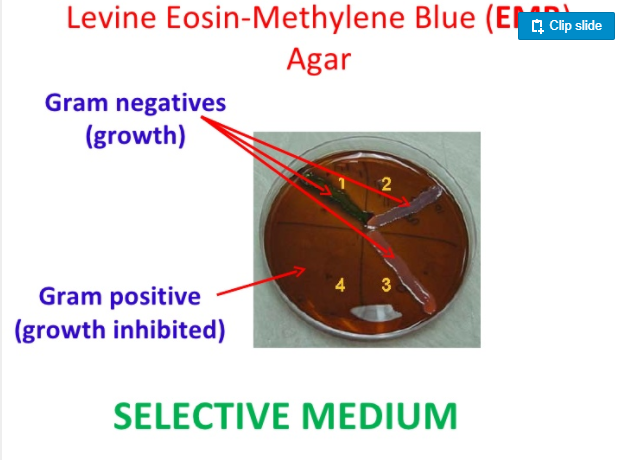 - EMB agar is considered a selective media for Gram-positive cells. 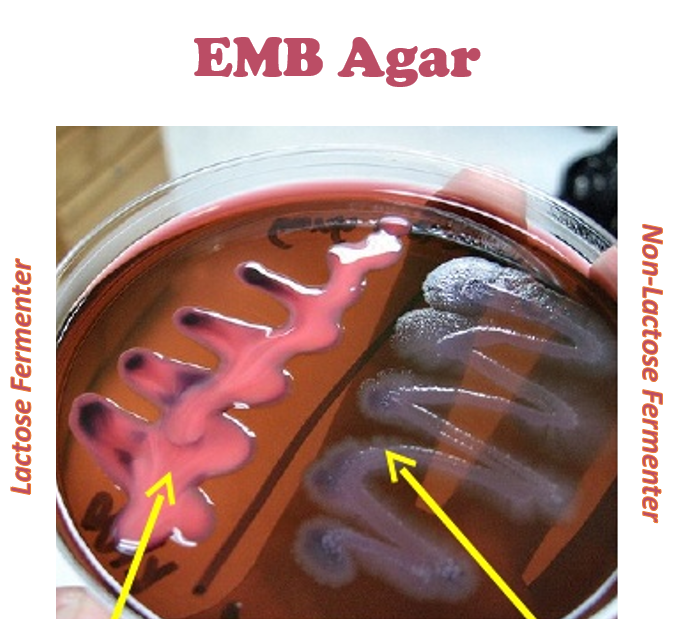 - EMB agar is considered a differential media with respect to lactose fermentation. contains the dyes eosin and methylene blue. Such a medium is selective for Gram-negative species. Lactose-fermenting organisms such as E. coli produce a black precipitate on EMB. Their colonies will be either black or possess dark centers with transparent, colorless peripheries. Non-lactose fermenters such as Proteus sp., Salmonella sp., or Shigella sp. appear pink or uncolored. 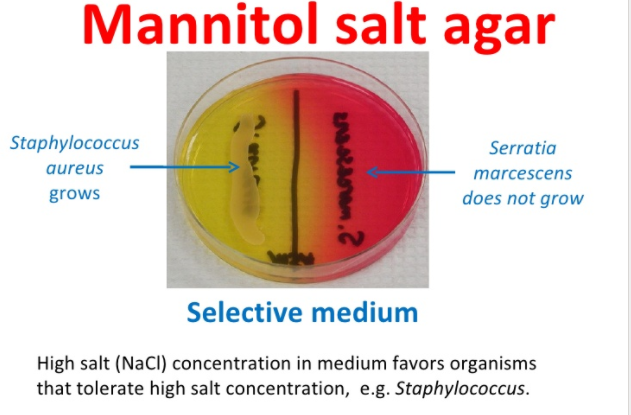 Mannitol salt agar (7.5% NaCl) is a medium selective for staphylococci and differential with respect to mannitol fermentation. Growth of most bacteria other than staphylococci, which are halophilic, is inhibited by the high concentration of salt in the medium. Fermentation of mannitol is only seen in the pathogenic species of Staphylococcos and is signaled by the production of acidic products leading phenol red in the media to change from a neutral red-orange to bright yellow. Non-pathogenic staphylococci produce small colonies surrounded by red or pink- purple zones due to the production of basic by products due to metabolism. Blood Agar (5% sheep’s blood- TSA plates) is a nutritive medium with differential properties in respect to hemolysis. Hemolysis is the destruction of erythrocytes (RBCs). The degree to which the erythrocytes are destroyed can be recognized by the effects of hemolytic enzymes on the cells in the medium. Complete breakdown of the RBCs is termed beta (β) hemolysis and is recognized by clearing around the colonies creating the hemolysin. Partial destruction of the RBCs leads to a greenish brown color on the agar and is termed alpha(α) hemolysis. Gamma (γ) hemolysis is usually the term applied to growth on blood agar that causes no damage to the RBCs and no change in the medium. Low-Oxygen Cultures - Low-oxygen cultures are required for growing microorganisms that thrive in low-oxygen environments. Oxygen-Free Cultures - Carbon dioxide incubators are used to remove oxygen from cultures of anaerobic microbes. Enrichment Cultures - A selective media is used that only allows the growth of specific microbes. Cold-Enrichment Cultures - Microbes that thrive in cold environments must be grown in a culture that is kept cold by refrigeration. Refrigeration (4°C) - This cold temperature will slow the growth of most microbial species without causing death. This is good for short-term storage (3-7 days). Deep-Freezing (-50°C to -95°C) - long-term storage requires colder temperatures of between -50 and -95 degrees Celsius. Lyophilization - This process "freeze dries" the cell culture. The culture is first frozen, then the water content of the culture is removed using vacuum. This is a good technique for log-term storage. So, how do we determine the numbers of individual cells in a culture or colony? Counting Colonies - Count individual colonies that are formed when plated. Membrane Filtration - The culture is filtered through a membrane filter then counted using a cell counter slide that contains an etched grid. The total number of cells is estimated from taking the mean average of several counted squares on the grid. Electronic Cell Counters - These devices count cells by determining how electrons from an electron beam going through a sample are blocked. The Most-Probable Number (MPN) Method - This is a statistical estimating technique based on the fact that the more bacteria in a sample, the more dilutions are required to reduce their number to zero. Turbidity - Determination of how "cloudy" a sample is using spectrophotometry. Barophiles - are specially adapted to live in high barometric pressure environments. organisms that require high salt concentrations for growth ...adding the term "obligate" means that the condition must be met in order to sustain life. An organism capable of growth in, but not requiring, 1-2% salt. The addition of the term "facultative" means the organism can tolerate the condition but does not require the condition. The process that some bacteria can perform that converts nitrogen gas from the atmosphere (N2) into ammonia (NH3). Plants then use this nitrogen from the ammonia, that they require to grow.